The term nanoelectronics refers to the use of nanotechnology in electronic components. These components are often only a few nanometers in size. However, the tinier electronic components become, the harder they are to manufacture. The first transistors built in 1947 were over 1 centimeter in size; the smallest working transistor today is 7 nanometers long – over 1.4 million times smaller (1 cm equals 10 million nanometers). The result of these efforts are billion-transistor processors where, once industry embraces 7nm manufacturing techniques, 20 billion transistor-based circuits are integrated into a single chip. Besides transistors, nanoelectronic devices play a role in data storage (memory). Here, spintronics – the study and exploitation in solid-state devices of electron spin and its associated magnetic moment, along with electric charge – is already an established technology. 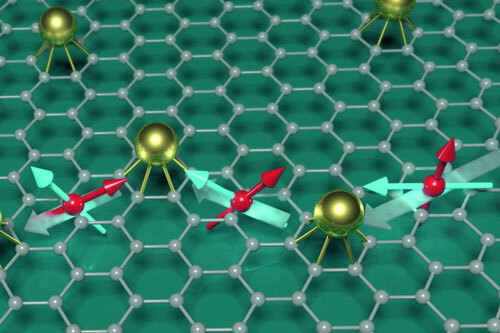 Read more: "Graphene spintronics - from science to technology". Spintronics also plays a role in new technologies that exploit quantum behavior for computing (read more: "Quantum computing moves forward with spintronics progress" and "The birth of topological spintronics"). Electronic devices that source, detect and control light – i.e. 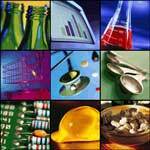 optoelectronic devices – come in many shapes and forms. Highly energy-efficient (less heat generation and power consumption) optical communications are increasingly important because they have the potential to solve one of the biggest problems of our information age: energy consumption. In the field of nanotechnology, materials like nanofibers (see for instance: "Light-emitting nanofibers shine the way for optoelectronic textiles") and carbon nanotubes have been used and especially graphene has shown exciting potential for optoelectronic devices. Display technologies can be grouped into three broad technology areas; Organic LEDs, electronic paper and other devices intended to show still images, and Field Emission Displays. For more, read our special section on Nanotechnology in Displays. The age of wearable electronics is upon us as witnessed by the fast growing array of smart watches, fitness bands and other advanced, next-generation health monitoring devices such as electronic stick-on tattoos. 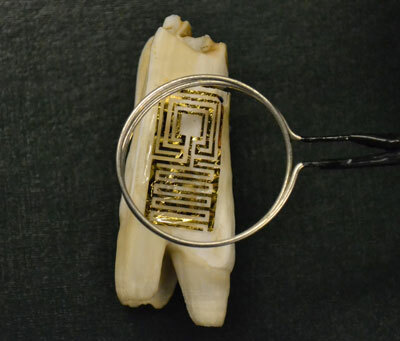 If current research is an indicator, wearable electronics will go far beyond just very small electronic devices or wearable, flexible computers. Not only will these devices be embedded in textile substrates but an electronics device or system could ultimately become the fabric itself. Electronic textiles (e-textiles) will allow the design and production of a new generation of garments with distributed sensors and electronic functions. Such e-textiles will have the revolutionary ability to sense, act, store, emit, and move – think biomedical monitoring functions or new man-machine interfaces – while ideally leveraging an existing low-cost textile manufacturing infrastructure (see for instance "wearing single-walled carbon nanotube electronics on your skin", a "temporary tattoo to monitor glucose levels" or "graphene nanosensor tattoo on teeth monitors bacteria in your mouth"). Solar cells and supercapacitors are examples of areas where nanoelectronics is playing a major role in energy generation and storage. To learn more read our detailed sections on Nanotechnology in Energy and Graphene Nanotechnology in Energy. Distinct from nanoelectronics, where devices are scaled down to nanoscale levels, molecular electronics deals with electronic processes that occur in molecular structures such as those found in nature, from photosynthesis to signal transduction. Molecular electronics aims at the fundamental understanding of charge transport through molecules and is motivated by the vision of molecular circuits to enable miniscule, powerful and energy efficient computers (see for instance: "Adding an optoelectronic component to molecular electronics").